I don't know you but when the spring is near, I feel a desire to give myself a makeover: new haircut, makeup and clothes. But even if I'm still planning which hairstyle I will do (lob? ), I know my makeup will be lighter and fresher, and my style brighter and colorful, wearing more pink and pastels, hopefully. If there is a garment that my wardrobe still needs, it's definitely a good pair of white jeans. Skinny or flared as the current trends, they are very versatile and perfectly match with everything, giving that irresistible easy-chic mood to each look. I personally prefer the skinny model but I also like the flares, especially for summer outfits. 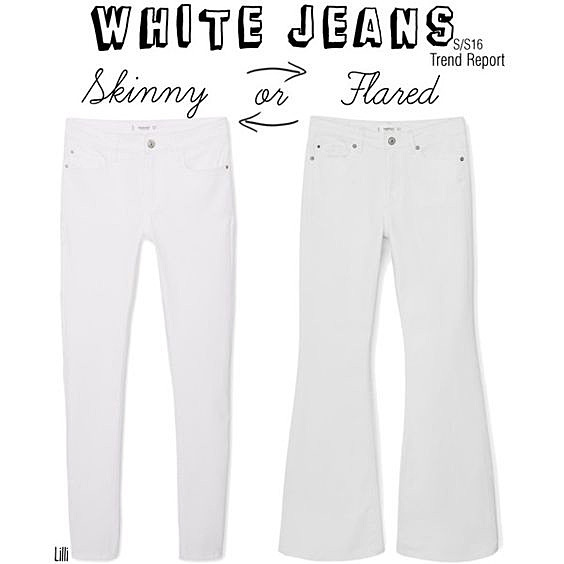 How about you, did you already own a pair of white denim or are you still looking for one? Are you planning a makeover with the start of thew new seson? Si ai jeans bianchi, ma non tagliare i tuoi bellissimi capelli biondi!!!! I have been putting away all my dark nail polish too, Lilli and been wearing lots of nudes and white with Spring just around the corner! I am hoping to get a new white jeans this Spring/Summer! Hmmm, I might have had a pair once in my life but I can't say for sure. Definitely very delicate to wear but it looks super glamourous! I would pick the skinny model because the flares might be out of fashion soon (just my guess). I'm into updating my make-up too. I'm excited to see the latest make up collections for Spring. I also love wearing white jeans. My favourite is the white skinny cropped pants. I can't wait to wear them. Io li adoro ne ho tantissimi, la maggior parte skinny. My white jeans are ready for Spring and Summer!